The Acer Aspire V3-571G-6622 offers one of the best value for the money as a budget gaming notebook. At a wallet-friendly Amazon price of $629.99. (discounted from a list price of $649.99) with free shipping, the Acer Aspire V3-571G-6622 is among the latest in the V3-571G series of affordable but competent gaming notebooks with 15.6-inch LED backlit display with 1366 x 768 HD resolution. With the letter ‘G’ in the model number designating that Acer is targeting the gaming market with a laptop that has exquisite multimedia features, this Acer offers one of the best value gaming laptop that is relatively cheaper than many other gaming notebooks with about the same feature set and using the same CPU and graphics card. Given its ability to play many of the most demanding games released in 2012 from low to high graphics settings, it is certainly one of the more competent yet cheap gaming computers recently released. The excellent gaming features provided by the CPU and GPU as discussed below. The Acer Aspire V3-751G uses the proprietary Acer CineCrystal™ HD LED-backlit display from LG-Philips which has the wider viewing angle advantage of an IPS (In-Plane Switching) display technology used in the Apple iPhones. It boasts of an outstanding display brightness of 305 cd/m2 and a contrast ratio of 1089:1 with a black value of 0.28 giving it excellent color-rich, deep blacks and high contrast display that are plainly obvious to the unaided eyes when compared with other laptops that use ordinary and inexpensive TN (Twisted Nematic) displays. Most laptops suffer from pathetic tiny sound that prompt gamers to use external powered speakers, this V3-751G uses the Dolby® Home Theater® v4 technology that enhances the listening experience, not necessary with the tiny speakers, but when connected to an external sound system. 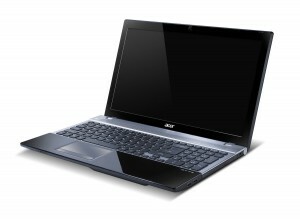 The Aspire V3 line used to be powered by the i5-2450M at 2.5 GHz clock speed from the Ivy Bridge processor generation. But the latest V3-571G-6622 and the similarly powered but more expensive V3-571G-53238G1TMaii (matte finish screen, full HD display at 1920 x 1080, 1TB HDD and Blu-ray drive) uses a third generation Intel Core i5-3230M processor clocked at 2.6 GHz capable of up to 3.2 GHz with Turbo Boost technology and comes with 3 MB L3 cache. The unit tested is supported by a single modules 4GB DDR3 RAM upgradable to 8 GB on the second bank. Along with the dedicated Nvidia GPU, the CPU comes integrated with the Intel HD Graphics 4000 which the Optimus technology can automatically switch to for relatively simpler graphics tasks like using office productivity tools that eat up low graphics computing resources and, hence, enable longer battery life between charges when not gaming. Using the 3D Maxon Cinebench, the performance scores of the Ivy Bridge i5-3230M CPU achieved the best results for this infrequently used CPU compared with the more widely used i5-3210M in mid-tier laptops. 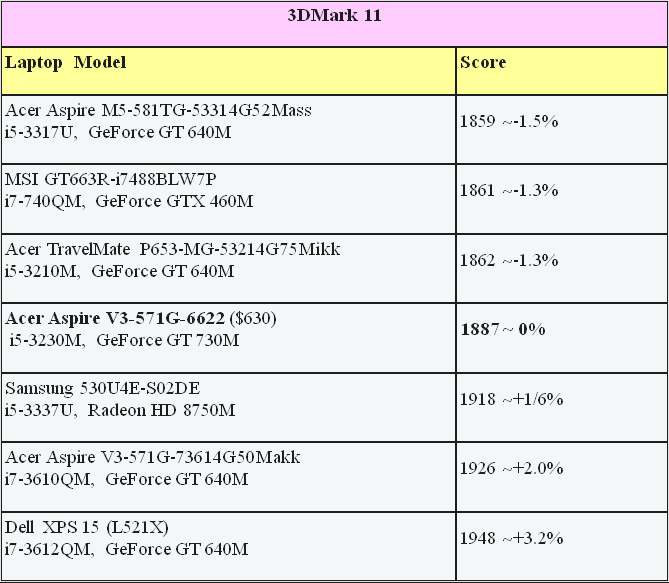 The benchmark scores from the i5-3230M shows it to be at par or slightly better. Table 1 shows the performance comparison between the Aspire V3-571G using the dual core engine and two other models using the more powerful quad core i7 variants as tested using the PCMark 7. It is interesting to note that the Aspire V3-571G registered the same performance scores as the MSI GE60 using a quad core processor and a more muscled GT 650M graphics card. Table 1: Comparative PCMark 7 scores between the Aspire V3-571 against two other laptops using variants of the same engine. you can clearly see the v3 571 is at par with some laptops over 1000. The Acer Aspire V3-571G uses the latest GeForce GT 730M with its own dedicated 2 GB DDR3 video RAM upgradable to 4 MB and uses 64/128 bit memory buss. The GT 730M is a middle-of-the-road DirectX 11graphics engine just released last January and constitutes the latest and beefiest update on the dedicated multimedia platform based on the older GT 640/GT645M using the same Kepler architecture in the GT 700M range but using a higher clock rate with a slightly lower energy consumption. It is currently number 5 most powerful among the eight GPUs in the GT 700M series. starting with the 720M at the bottom and topped with the GT 750M in SLI mode. 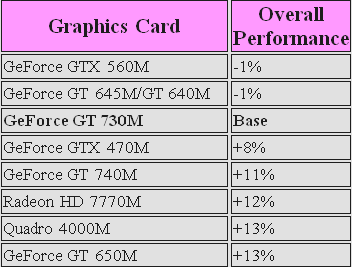 Table 2 shows the relative power of the GT 730M compared with other graphics engines within a plus or minus 12% range that are often used in laptops at various price points. 730m has 384 shader cores @ 725 mhz, that means more power and faster processing. Perhaps it can be said that based on the benchmark figures that gives it the same performance numbers in several tests comparing it with the GT 640M and 645M, the GT 730M may just be a re-brand for an old GPU model. With core clocked at 725 MHz and its DDR3 memory running at 900 MHz, and using its default ForceWare 307.17 driver, the test scores on the new V3-571G-6622 has not provided any significant graphics performance push from the older quad-core powered V3-571G-73614G50Makk model that used an older GT 640M GPU. Table 3 reveals the major role of the GPU in enhancing game play as using a more powerful i7 quad core CPU cannot compensate for a weaker graphics card such as what is used in the MSI GT663R. The gaming performance made possible by the GT 730M enjoying its own DDR3 video RAM depends on the clock rate and is generally on the same or slightly above performance as using the older GT 640M/GT 645M but with slightly improved power efficiency. As shown in Table 4, demanding games released in 2012 such as Anno 2070, Dishonored, Call of Duty: Black Ops 2, Diablo III, and Mass Effect 3 can be played seamlessly at their high game settings using the laptop’s default HD resolution of 1366 x768. Less demanding games should have no problem playing fluidly even at high setting and maxed resolution, On the other hand, Hitman: Absolution, Far Cry 3and Skyrim: Elder Scrolls V, are best played in the low to medium settings. Weighing a backpack-friendly 5.7 lbs, this Acer Aspire V3-571G comes with 15.6-inch LED-backlit widescreen that has a 1366 x 768 HD resolution typical of most other notebooks on the market. Storage: It comes with 500GB SATA hard disk drive running at 5,400 rpm from Seagate Momentus. Optical drive: It comes with an 8x DVD Super multi Double layer drive. Physical Attributes: Designed with midnight black in slim body just 1.3-inch thick when closed and weighing just 5.7 lbs. Multimedia. This Acer Aspire V3 also makes for a superb multimedia notebook with audio enhancement from its Dolby Advanced Audio v4.0 driving two in-built stereo speakers. Gamers can get significantly better listening experience with a decent pair of headphones. There’s also a 1.3 megapixel webcam with 1280 x 1024 resolution that support video chatting. Wired connectivity. It comes supported by a couple of USB 2.0 ports and a single USB 3.0 port, along with a single HDMI port. Battery. A user-removable 6-cell li-ion battery rated at 4,400mAh powers the notebook for up to 4.5 hours between charges. The only titles that in our tests exhibited some frame jitter problems even at medium game setting is Far Cry 3 and Hitman: Absolution. All the rest played seamlessly. In addition, the screen is a magnet for finger prints due to its high gloss surface in contrast to the matte finish in the more expensive V3-571G- 53238G1TMaii . And like most other laptops, the notebook’s touchpad can be less than responsive than using an external mouse. In addition, the usual tiny sound with no bass can be rectified using external powered speakers or high fidelity headphones that can do justice to its superb Dolby Advanced Audio v4.0 sound enhancing circuitry. The 500 GB drive can easily fill up with today’s large gaming and multimedia files and you can expect an upgrade later on or use an external drive. The Aspire V3-571G-6622 uses a third generation Intel Core i5 2450M processor clocked at 2.6 GHz capable of up to 3.2 GHz with Turbo Boost technology. It is paired to a graphics engine from Nvidia, the GeForce GT 730M with its own dedicated 2 GB DDR3 video RAM on top of a single modules 4GB DDR3 RAM upgradable to 8 GB on the second bank. Like other notebooks with a separate graphics card, this notebook outperforms any cheaper notebook that sports an integrated CPU +GPU in one chip. Weighing a backpack-friendly 5.7 lbs, this Acer Aspire V3-571G comes with 15.6-inch LED-backlit widescreen that has a 1366 x 768 HD resolution typical of most other notebooks on the market. It comes with 500GB SATA hard disk drive running at 5,400 rpm and an 8x DVD Super multi Double layer drive housed in slim body just 1.3-inch thick when closed. Bundled with a 32-bit Windows 8 OS, the Acer Aspire V3-571G-6622 also makes for a superb multimedia notebook with audio enhancement from its Dolby Advanced Audio v4.0 driving two in-built stereo speakers. Gamers can get significantly better listening experience with a decent pair of headphones. There’s also a 1.3 megapixel webcam with 1280 x 1024 resolution that support video chatting. A user-removable 6-cell li-ion battery rated at 4,400mAh powers the notebook for up to 4.5 hours. Surfing the net over WiFi hotspots brings this down to about 3 hours. Wireless data connectivity is supported by its WiFi 802.11 b/g/n and Bluetooth 4.0, while wired connectivity is supported by a couple of USB 2.0 ports and a single USB 3.0 port, along with a single HDMI port. The NVidia GT 730M used in this Acer model is a middle-of-the-road DirectX 11graphics cards just released last January. It is based on the older 645M but with higher clock rates and slightly lower power consumption as a result of some minor technical enhancements. 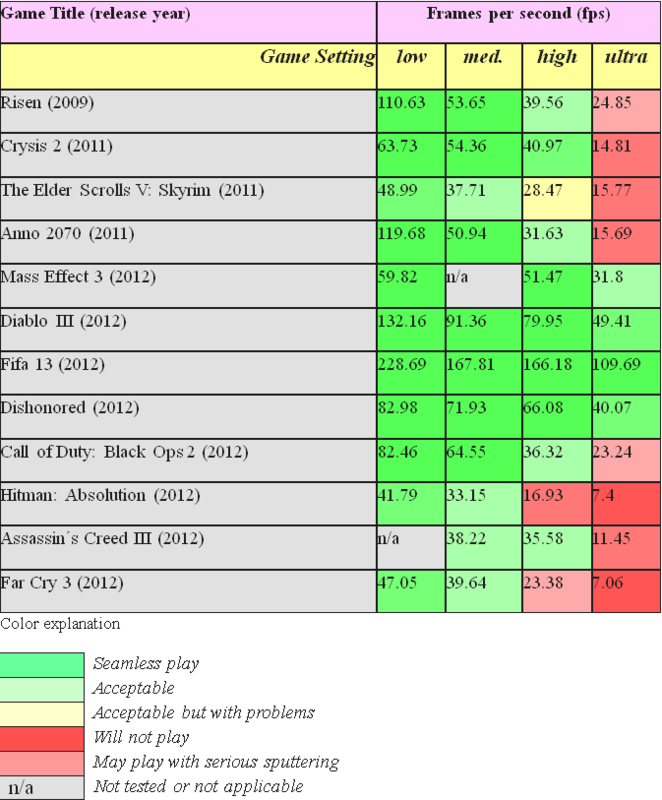 Demanding games of 2012 such as Call of Duty: Black Ops 2, Anno 2070, Assassin’s Creed, Need for Speed, Max Payne 3, Diablo III, Most Wanted, Medal of Honor: Warfighter, and Dishonored, to mention some, should have no problem playing fluidly even at high setting and maxed resolution, On the other hand, Hitman: Absolution, Risen 2: Dark Waters Battlefield 3, and Skyrim: Elder Scrolls V, are best played in the low to medium settings. The only title that has some gaming problems even at low setting is Far Cry 3 which sometimes stutters at 27fps. Other than that, the notebook’s touchpad and tiny sound can be an issue many gamers but this can be remedied with an external mouse and a decent pair of headphones. The 500 GB drive can easily be outlived and you can expect an upgrade later on or use an external drive. For the serious gamer who wants to use the latest gizmo but constrained by budget considerations for an affordable gaming computer, this Acer Aspire V3-571G offers the midrange option that seamlessly handle most of the RPG and FSP game releases for 2012. With a middle-of-the-road HD resolution and a muscled CPU and GPU tandem, casual gamers will be delighted while serious gamers can use it as an alternate or back-up portable gaming PC for their more muscled desktop gaming stations, without ever breaking their bank accounts. There’s always the temptation to add a few more dollars to go up a notch higher in gaming power and feature. But the temptation can end here. Of course, you can always upgrade with a few more added cost on a larger hard drive or system RAM to 8GB upon purchase. You can buy it here. For budget gamer that is looking for the right laptop for the right price - this ones for you!